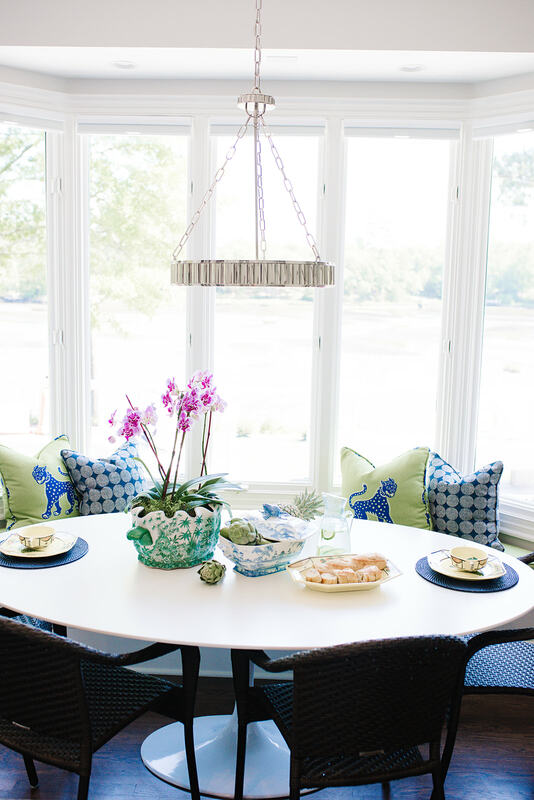 Retired executives from D.C., our clients enjoy boating and were ready to embrace a new, laidback lifestyle on the coast, but this isn’t your average coastal home interior. “The clients have a sense of humor,” says designer Jo Howell, “and that shows through in the personality of their home." 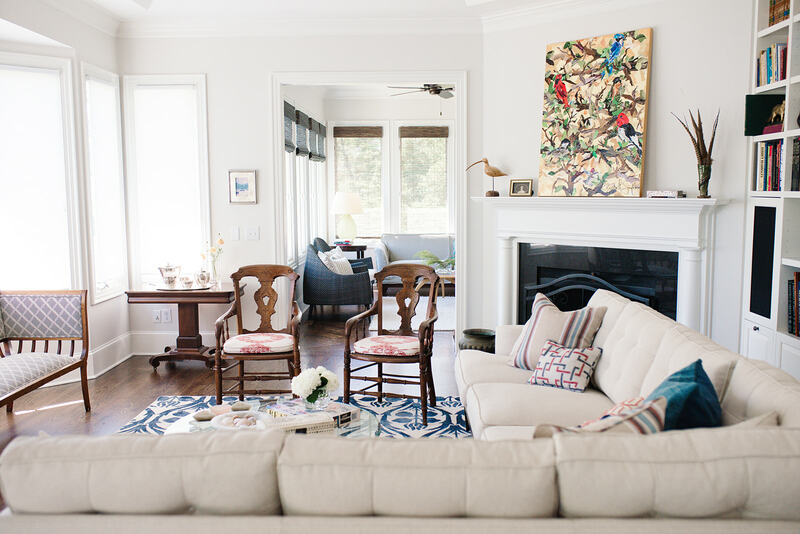 The clients had an assortment of existing antique furniture and artwork that speak to their southern family history. We took these pieces and brought new life into them. Jo was able to incorporate their traditional, realistic painted family portraits and royal family tea canisters alongside bold, edgy fabrics and a baby grand piano in a way that speaks to the client’s history and a bit of their whimsy. 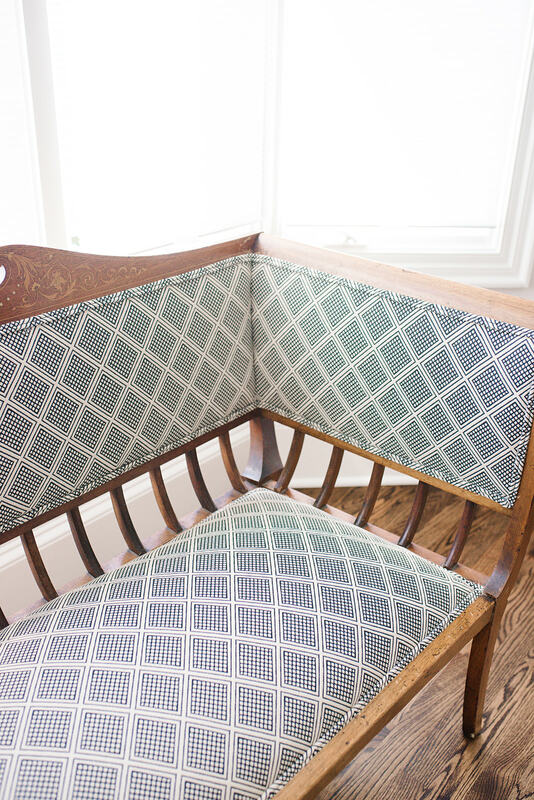 Another statement is the grandmother’s elegant settee that was refinished and reupholstered with a geometric black and white fabric. 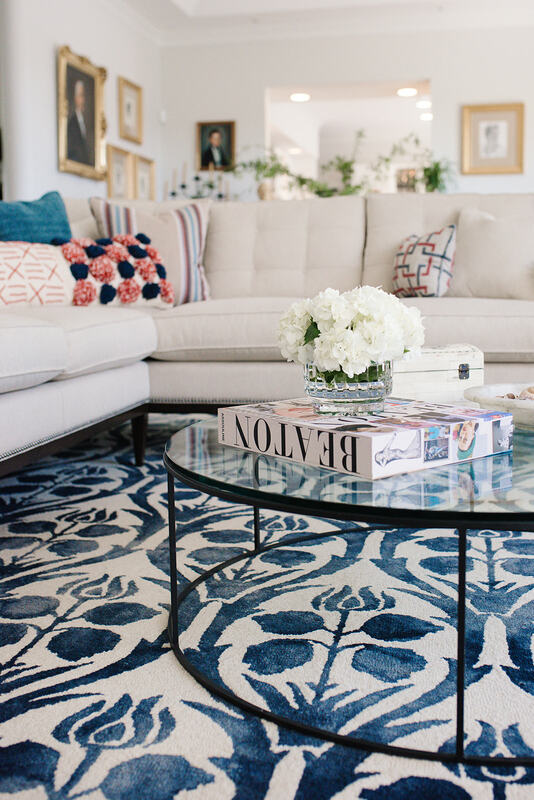 "This project was fusing their new lifestyle with their personal pieces." The project included a complete renovation of the master suite as well as new finishes, paint, reupholstered furniture and hardwoods throughout the house. The foyer, as it was intended to do, sets the Classically Modern vibe for the rest of the home. 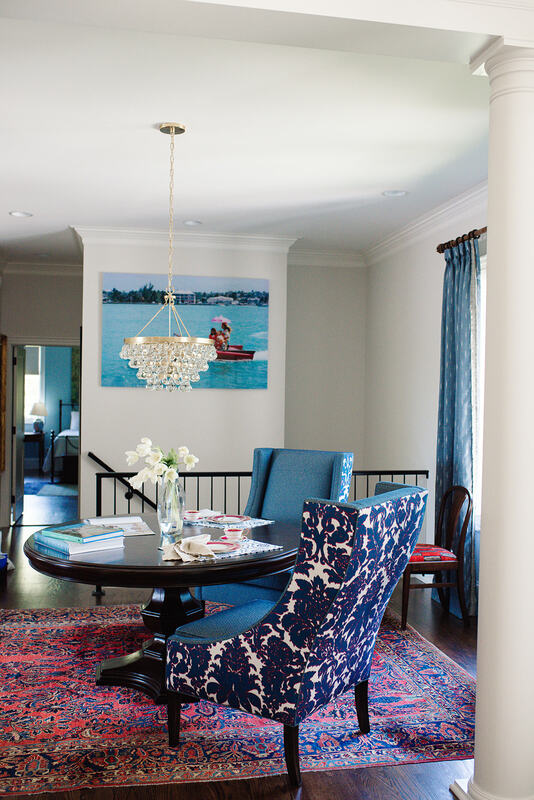 Welcoming anyone who enters the house is a Jonathan Adler print of photographer Slim Aaron’s “Sea Drive”. It’s a 1960’s retro-modern photograph of a family taking a joy ride across the water in an Amphicar. The print is accompanied by a set of host and hostess chairs in the foyer with a fresh accent of Celerie Kemble fabric on the back that communicate effortlessly with the traditional rug from the clients’ collection which they sit on for a really interesting conversation about how to have a modern take on classic designs. Jo successfully pulled out an infusion of red and freshened it up with blue details to keep it from being the traditional heavy color palate. The walls throughout the home are a perfect white for a beach home. 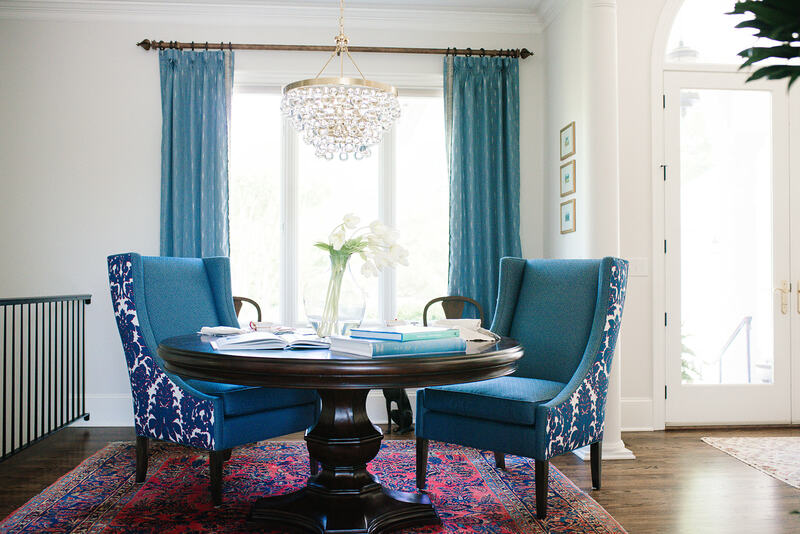 They set a light, airy backdrop that elevates the saturated accent colors. 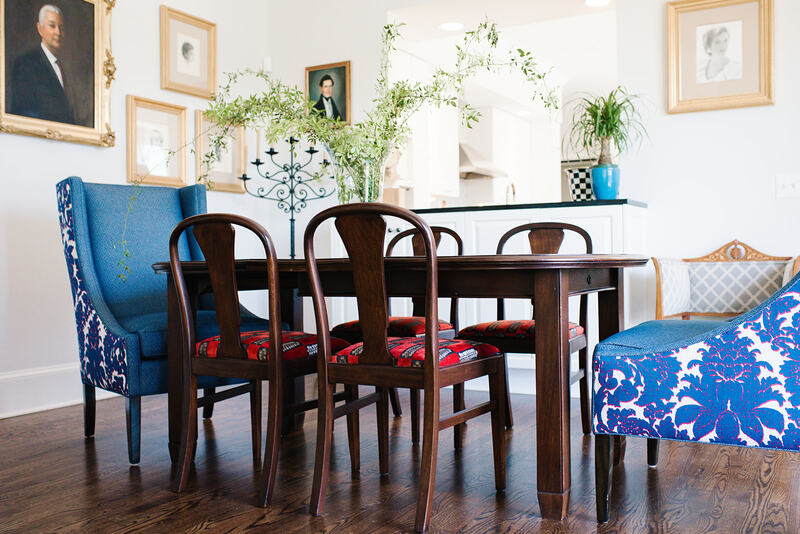 "The clients have a sense of humor,” says designer Jo Howell, “and that shows through in the personality of their home.